Carpet Cleaning – Why use a Pro? Why should anyone call a professional carpet cleaner instead of renting a do it yourself machine or an amateur? Renting a carpet cleaning machine may appear to be cheap but once you add on any additional products and days you need to keep the machine the bill starts racking up. It is certainly not as easy as you think. Pushing this machine is easy at first but once it starts collecting the dirt and water from your carpet the machine becomes heavy and after a couple of rooms you will probably be exhausted! On top of that once you have cleaned a couple of rooms you will have to dump out that nasty, stinky water and then reload and pick up where you left off. Overall this method is a lot of hard work and can become stressful. Amateurs often use portable machines which are not worth spending your hard earned money on. Portable are a slight step up from the DIY machines. 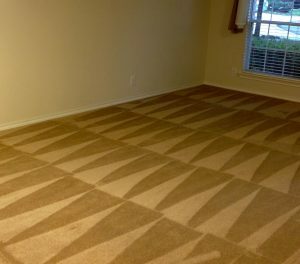 In some cases they can get the job done but in most they will not get your carpets as clean as a truck mounted machine. Portables cannot get as hot so it does not 100% sanitizes your carpets. On the surface it might look good but soon enough whatever appears to be gone will reappear. 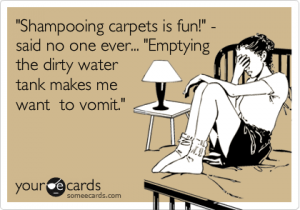 So why use a pro when it comes to carpet cleaning? Well for starters a professional carpet cleaner will have all the proper tools, equipment, and products to clean your carpets. The vans of Beyer Carpet Cleaning are always stocked and ready to go with every possible product and tool that could be needed on a job. Professionals with truck mounted machines often use steam that is hotter than 200 degrees so it will completely sanitize your carpets. Professional carpet cleaners can reach well below the surface of your carpets to get to the root of stain and to extract all the water that has been used to clean your carpets. Carpet cleaning isn’t easy but for professionals it takes half the time because they don’t have heavy machines to push around and they don’t have to constantly dump out dirty water. Yes, using a professional may cost a little more then a DIY machine but in the end it is worth it. Beyer Carpet Cleaning does not hit their customers over the head with prices so it is affordable and timely. Your carpet cleaning can be done within just a few short hours instead of it being an all day or two day project. So San Antonio the next time you decide to have your carpets cleaned skip the mess, hassle, and stress and just call a professional like Beyer Carpet Cleaning.